Most any dialog that require folder paths or file patterns can accept either simple entries, e.g. or very complex strings that specify not only what to include but also what to exclude from a, most typically, search. This page describes the complete description of how to use these fields to their full advantage. If you would like to collect files on all of drive D: and in the My Documents and My Installations folders on drive C: enter the following. Would search all of drive C: except for files and folders in and below any root folders beginning with a 'C' and ending in 's'. 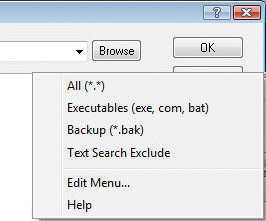 Enter the names or name patterns of files and folders you want included in the search. Leaving the field empty is the same as specifying a single asterisk '*' or the traditional '*. *' meaning include all files. Separate multiple patterns with the bar character '|'. The common wildcard characters '*' and '?' can be used when specifying groups of file to be included. The entry *.tmp | *.bak | ~* will find all files with the extension tmp and bak as well as all files beginning with the tilde character '~'. Specific files and groups of files can be excluded from the search by preceding the files with a minus sign, '-'. If the name actually begins with a minus sign, simply put another in front of it, e.g. " --notations.txt". (Note that there is no *. * or just * in the beginning. Remember that if there is no include specification then *. * (all) is assumed. For example the these two patterns are equivalent: -*.zip and *. * | -*.zip (include all files except those with the zip extension). Displays a pop up menu of predefined file patterns that can be quickly added to the 'Patterns' field to the left. The patterns fly out can hold up to a maximum of twenty entries. Allows you to edit the contents of the Patterns: drop-down list box.